Adobe PDF is a great format for sharing your 3D content. Converting 3D models, technical assets into Adobe PDF documents with FinalMesh. If you are looking for modern, sophisticated and easy to use converter, FinalMesh is what you need. How to create 3D PDF model? 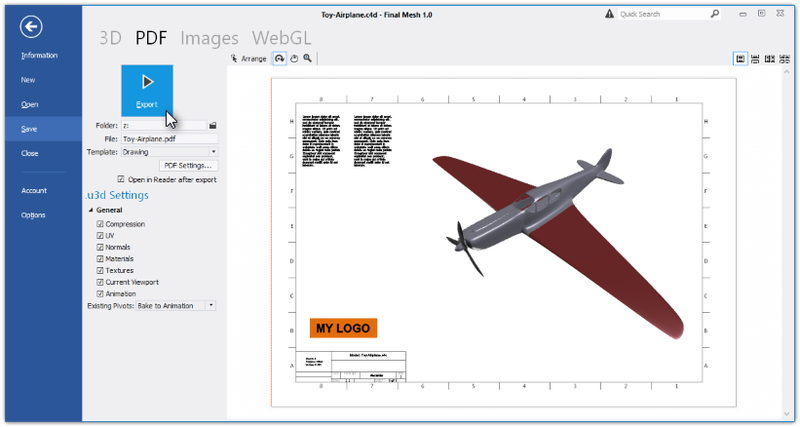 Load any 3d model into FinalMesh application, choose best view and in File menu select Save As , PDF. Select template, tweak export options. Click Export and view file in Adobe Acrobat. Everything is really that simple. A great feature of FinalMesh PDF publisher is in displaying PDF in the same way as it will look in Adobe Acrobat. You may rotate or zoom a model in order to select a perefect initial point of view, select render mode or light type. 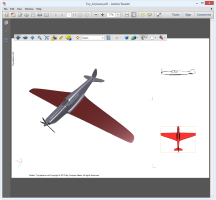 Model in Acrobat will look in the same way. 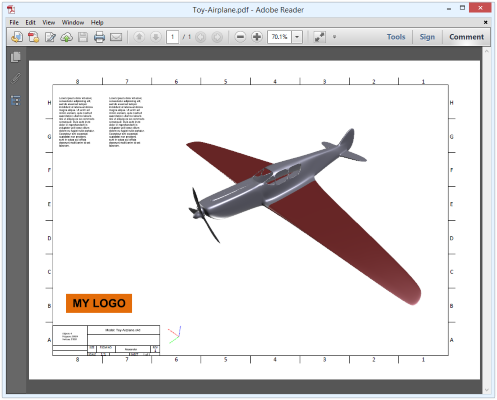 Embedding 3d content into custom made template or printed document. Ability to adjust initial view right in save pane. Support for PDF render modes and lights. Model Views - prediefined view points. Multiple viewports of a single 3D model, even of differend pages. PDF may contain regular text pages. For instance it may be terms and coditions or technical description. All types of PDF Encryptions are supported. Signature - PDF may be signed. FinalMesh works quite close with priPrinter application. priPrinter - our PDF authoring software and printing software. There are two possible scenerious. Create templates in priPrinter and save it for use in FinalMesh. Save 3D model as .u3d file in FinalMesh and use this model in priPrinter. First choice is If you want to create similar PDFs with different 3D content, while second one is for inserting a 3d model into many PDFs. Download and Install priPrinter Professional. Design a document in any application, it may be even MS Word. Write common description, put logo of your company, leave empty place for 3D View. Print it to priPrinter. In priPrinter, go to Insert tab. Click on 3D - 3D Content button. This will insert 3D viewport, adjust it's size and position. In Properties dialog, select default lighting, background, render mode and default view. You may want to make final adjustments, like add watermarks. Watermarks may contain macros, it may be numbers of polygons in 3D model or something like that. In File Menu, select "Save As 3D Template". Now this template will be available in FinalMesh PDF Publisher panel. Later you may change something in this template. For creating template, priPrinter license is not required. In FinalMesh save model to u3d file. Drag and Drop this to priPrinter or Create 3D Content (like in previous topic) and provide file name to that file. Adjust viewport size and probably lighting or render mode. In File menu, select Save As PDF. 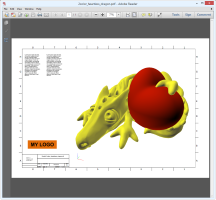 By using this method you may insert many 3d models into single PDF file.